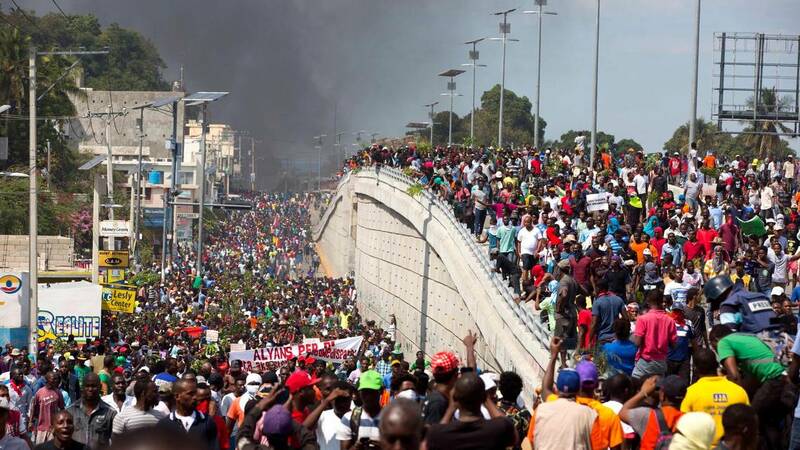 Anti-government protests have broken out all over Haiti today, and so far I have seen nothing about it in the news. They are demanding the resignation of President Moise and his administration. Today is the second anniversary of his inauguration. It is also the 28th anniversary of the inauguration of Haiti's 1st democratically elected president Jean-Bertrand Aristide. Here is some of what I have gathered so far. Return for updates soon. It’s been 33 years since Haiti welcomed democracy. How did it mark the day? Protests. Thirty-three years after Haitian President-for-Life Jean-Claude “Baby Doc” Duvalier fled into exile, ending his family’s 28-year dictatorship and ushering in Haiti’s democratic transition, Haitians marked the day Thursday with widespread protests throughout the country. Angry over their plummeting currency, frustrated by the rising cost of living and disappointed by decades of failed leadership and rampant corruption, protesters threw rocks, burned tires, attacked police stations and blocked roads in major cities while calling for the resignation of President Jovenel Moïse, who also marked his second anniversary in office Thursday. Haiti Protests Continue for a fourth day!